Section headings and selected papers. Casthouse Structure and Grain Refining. Influence of base metal grain size on the aluminum weld bead structure, P M Toledo & R E Trevisan. Injection of non-wetting particles into melts, T A Engh & A Johnston. The utilization of niobium as aluminum grain refiner, M H Robert. Carbon. Performance of a paste with a high softening point pitch for Soderberg anodes, M Barber & A Proulx. Modelling of the coke calcining kiln, J Perron et al. Casthouse Process Control and Operations. Mathematical modelling of flows in holding furnaces containing molten aluminum, D Frayce et al. Aluminum and lithium recovery from scraps of aluminum lithium alloys, P H Galvin & M Demange. Computer assisted process analysis of the casting furnace, R T Bui et al. Alumina and Aluminum: Controls and Measurements. The automated control of bath composition on high amperage cells, J M Peyneau. Gas induced waves at the bath-metal interface in Hall-Heroult cells, S Rolseth et al. Cast Alloy Modification. Quality improvement by strontium modification of low pressure aluminum castings, B Closset. Modification of aluminum silicon cast alloys by rare earth addition, E Selcuk. Porosity in aluminum foundry alloys - the effect of modification, D Argo & J E Gruzleski. Alumina and Aluminum: Process and Operations. Start-up of vertical Soderberg potlines at Reynolds Baie-Comeau plant, N Dube. Hydrolysis treatment of cyanides in spent potliner leachate, F Kimmerle et al. Modernization of venalum pots, H Medina et al. 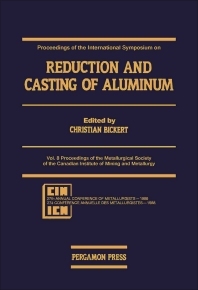 The International Symposium on Reduction and Casting of Aluminum is sponsored by the newly founded Light Metals Section. The Symposium will feature casthouse process control, operations, structure and grain refining, carbon, cast alloy modifications, alumina and aluminum - controls and measurements, process and operations.